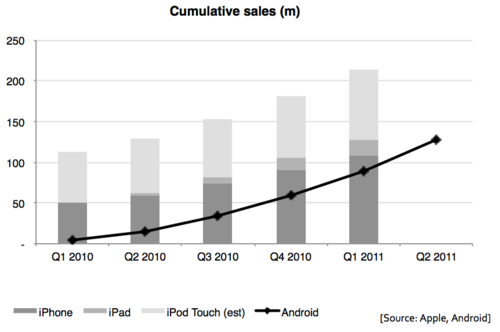 This chart shows iOS and Android cumulative device sales. The installed base is slightly different (Apple only just passed 200m) but the installed base figure for Android is almost exactly the same, since almost all Android devices have been sold so recently that few will have been abandoned. Google numbers were out yesterday - Apple numbers for the June quarter are out on Tuesday. Amusingly, Google doesn’t disclose hard tablet numbers (since they’re tiny), while Apple is now talking about iOS users (which include 80m or so iPod Touches) to distract attention from the fact that the iPhone has now almost certainly been overtaken by Android. This is driven mainly by the fact that Android phones sell for half to a third the price of the iPhone. Of course, any new pricing structure for the iPhone (i.e. competing at the $200 price point) would change everything. Let’s see.